Phil – f&cking hilarious! 1 vote. Phil, I still haven’t received last month’s payment to keep letting you win. Sorry barndog, phil gets my vote too. Who doesn’t love a vulture’s head up a buffolo’s bum joke. I’ve loved them ever since i was a kid. Alas, I too vote for Phil. But only because it reminds me of the time I wiped a booger on his sandwich and didn’t tell him. Sandwich…? Hey I remember that sandwich! I was wondering why my raisin bread only had one raisin in it! No, I have to stick with the Barndog on this one! I love pork, especially when an apple and snuggles are involved. It really is the other white meat. One what? One charity vote? Sick in such a lovely way. doesthat count as a vote? 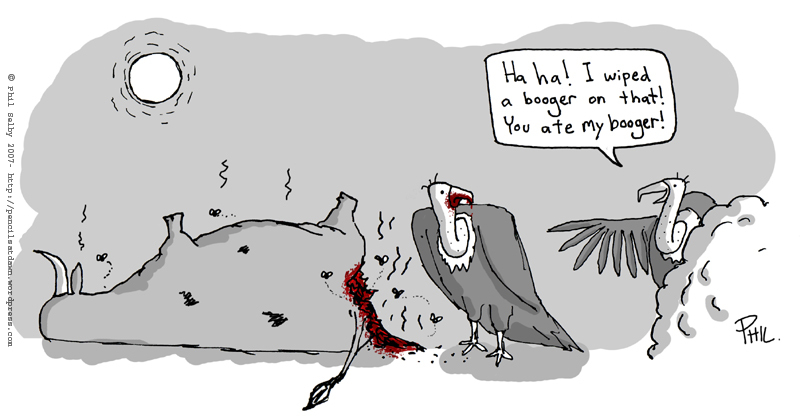 if so I vote yeah, the world needs more good clean carrion based humor. HA! I go for number 1, Mike’s. ` Aw F***! Both are just so disgusting… I love the second one, just because it makes me want to puke.